Brockenhurst has a long and colourful history, including a tradition that badgers, or brocks, as they are often called, lent their name to the village. Not everybody is convinced, however, even though badgers are common local residents, for many consider it more likely that the name comes from a remarkably similar pre-Norman Conquest version, Brocenhyrst, which refers to a ‘broken wooded hill’, as in a hill intersected by streams or featuring many clearings. But whatever the name derivation, Brockenhurst is an ancient place. In fact, Brockenhurst has reputedly the oldest church in the New Forest – that dedicated to St. Nicholas, on the outskirts of the village. The presence of a church in Brockenhurst was mentioned in the Domesday Book of 1086 – Brockenhurst was then called Broceste - and was the only New Forest church recorded. Within the church, evidence of Saxon and Norman work remains, although much of the building is of later date. And in the best of traditions, beside the porch stands a magnificent yew tree that is said to be over 1,000 years old. Close to Brockenhurst Parish Church is Brockenhurst House, set apart from the village in its splendid parkland environment. Back in 1789, Richardson, King and Driver on the first reasonably accurate, relatively large scale map of the New Forest showed the house as occupied by Edwd. Morant Esqr, then newly arrived in the village with wealth from sugar plantations in Jamaica. He purchased the site in 1769, along with nearby Roydon Manor in 1771, and replaced an existing Elizabethan farmhouse with a palatial Georgian structure which itself gave way in the late-1950s to the present building. New Park is a short distance to the north of Brockenhurst, and like the New Forest, is not ‘new’ at all. In fact, a reference to New Park was first noted in 1484 when the name was used to differentiate it from Lyndhurst Old Park, a medieval deer park with even greater pedigree. New Park was a favourite hunting lodge of King Charles II who in 1670 extended the grounds to accommodate a herd of red deer brought over from France. 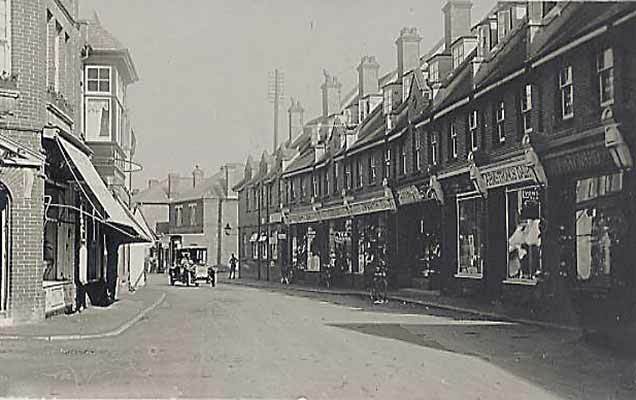 Brockenhurst’s growth, though, from a tiny hamlet to today’s substantially sized village, was more closely associated with improved transport links, than with church, parks or manor houses. 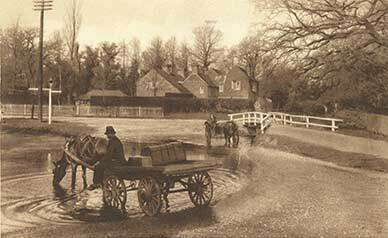 First, in 1765, the turnpike arrived in Brockenhurst. Operated by The Lymington, Lyndhurst and Rumbridge Turnpike Trust, this road ran along the route of the current A337, and by 1789, Richardson, King and Driver show numerous properties dotted along the roadside, including the Rose and Crown Alehouse. Then along came the railway. Opened in 1847 as part of the Southampton to Dorchester line, the railway brought an influx of visitors from towns along the route, and significantly stimulated business and housing expansion - by 1901, the 1841 population of 928 had increased to 1,585. Growth, though, was relatively slow. The 1870s Ordnance Survey map continues to show a relatively sparsely populated area, although by the time of the 1898 and 1909 maps, the layout of much of today’s village is evident, particularly around the station and the part of Brookley Road that now forms the main shopping street. Notice on all three maps that the Watersplash is marked as a 'ford'. And whilst the old parish church, located ½ kilometre (1/3 mile) from the new village centre, did not move with the people, another church, St. Saviour’s, was built. Construction started in 1895, and the church hosted its first congregation in 1905. Services continue to be shared between ‘old’ and ‘new’ churches. During the First World War, wounded soldiers from the trenches were brought to Brockenhurst to be treated in hospitals set up in some of the village’s larger houses and hotels, and in fields near the old parish church. Many of the troops were from around the British Empire, from Australia, Canada, India and New Zealand. Indeed, the graves of almost 100 New Zealanders can be found in the parish churchyard, not far from the grave of Brusher Mills, the renowned New Forest snake-catcher. Brockenhurst played its part, too, in the Second World War. 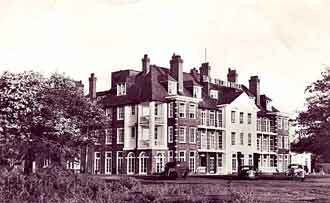 The Balmer Lawn Hotel, for example, was pressed into service, first as a Staff College, then as the Divisional Headquarters of the Royal Marine Infantry Division, and later for planning the invasion of Normandy. Brockenhurst today thrives as a popular residential area and New Forest visitor destination. And, of course, history continues to be made.